How incredibly awesome was this show? And it was the perfect length – at 12 episodes – not too long, not too short – just right. I had read a bad review of it and skipped watching it for a long time, but decided to check it out recently… and twelve hours later, this binge-inducing show had completely swept me off the planet and into an exciting world of intrigue and suspicion! Plot in a nutshell – a new reality show tests people moral aptitudes and problem solving skills as they attempt to win money in increasingly difficult ways. This is a character driven show – and after a few games you are down to a small number of key players and you get a firm sense of their personalities, faults and strengths without the use of backstories or flashbacks (exception to the rule being the main three characters). 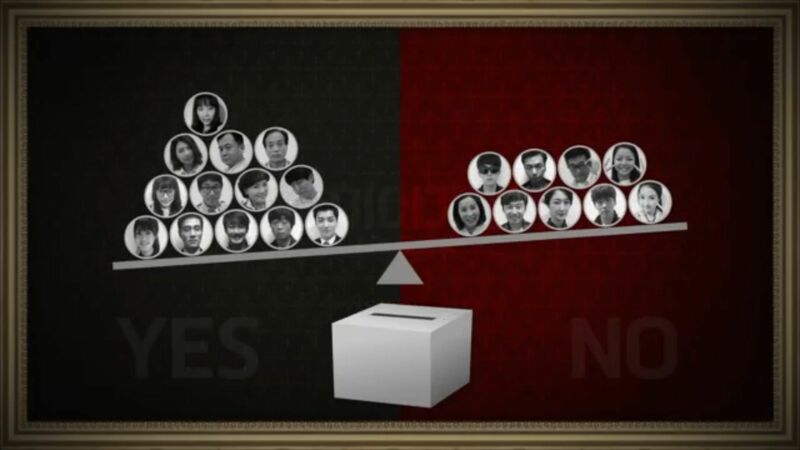 What lines are they willing to cross for money? And is there a darker secret behind the show? Overall Rating – 10/10. Manipulation Is A Group Sport! More discussion and very mild spoilers follow (cause I don’t want to spoil the excitement!)…. I wonder how many people may have not watched a show because of a review I wrote? Anyways, this just proves the old saying “To Each His Own.” There is a lot of variety in K-Dramas and a lot of variety in the viewers enjoying them… and even when you find someone who likes a lot of the same things as you do, we may not always match up. So how could someone give this show a bad review? Well, the games are complicated. It’s no lie. The rules are involved. On two separate games I actually watched the rules being explained, then immediately jumped back to the beginning of that scene and rewatched them. Cause there are a lot of complicated rules. But that’s why the show is so good! It’s not easy peasy. These aren’t little kid games. These are grown up games. Difficult games. The reviewer also said the games got boring, but I don’t agree at all. I loved every single one of the games (there are maybe half a dozen). A lot of times, I thought I had figured out the puzzle early on and felt quite smug and proud of myself… but almost without fail it was a red herring, or I had only gotten a piece of the puzzle, or the obvious piece, and I felt outsmarted and outwitted by these genius masterminds at every turn! So many red herrings. I may have kinda, sorta figured out the basics to two of the games early on… but that was it. Most of the time, I was stunned by the unexpected turns in the plotlines. There was also general bitching about the naive female lead… but that was her character. And some more bitching about the lack of romance, which didn’t bother me as that was not what this show was about. It was a show about people. About strong, bizarre, and fascinating characters whose lives get tangled up. So who are the characters? 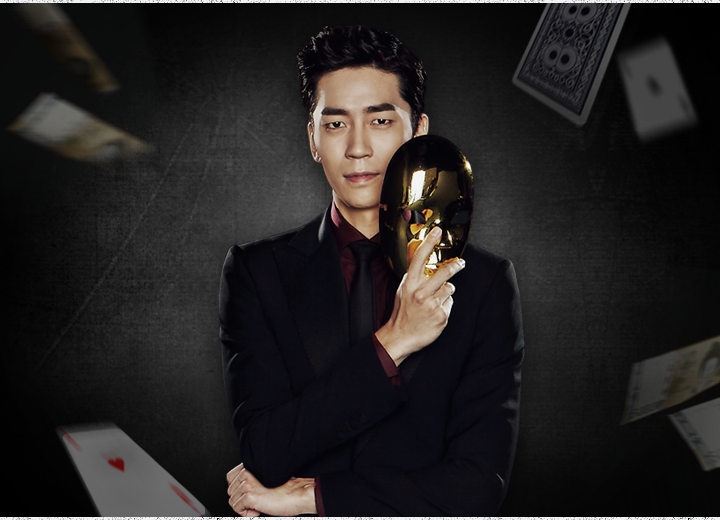 We have the host of the show… played by Shin Sung-Rok, who delighted me as the evil killer in My Love From Another Star and was even more spellbinding in this show as the unhinged mastermind of the Liar Game. His skin is flawless, he’s handsome and suave. And he just has a face made for wickedness. Even when he smiles, he seems devious. I have yet to see this guy walk around in a tee shirt and jeans playing an average dude, so it seems hard to imagine, but he’s such a good actor I doubt there is any role he couldn’t conquer. I will admit I love him as a bad guy. He was twisted in this show! Those little smirks? His rages? Watching him stare at himself in the mirror… chills. 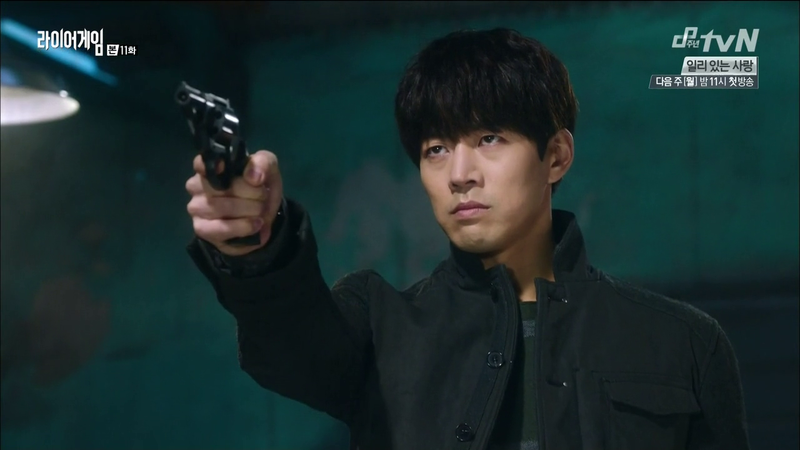 On the other side of the game, we have the “good” guy, played by Lee Sang-Yoon. He’s a professor of psychology who turned his brilliant mind to crime for vengeance. Recently let out of prison, he’s brought into the Liar Game through an acquaintance and gets sucked into its complicated plot. First by the allure of the wide eyed innocence of the main female, but ultimately because of the shows ties to his own dark past. This character was fascinating. He was intelligent, withdrawn, calculating and often cruel in his pursuit of victory. His vendetta drove him to extremes. The little boy bangs did nothing to diminish his brutal cold stare. 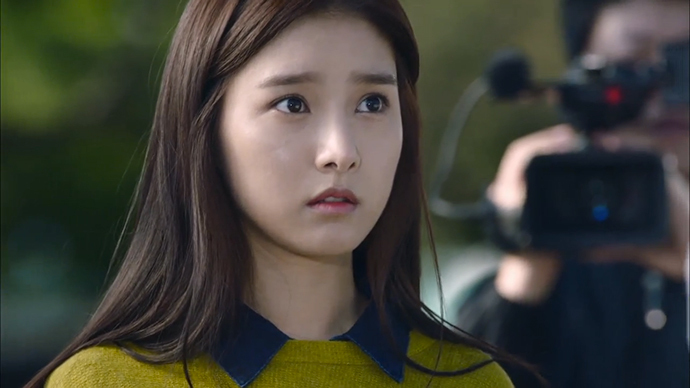 Kim So-Eun played the third main character, the innocent naive girl brought into the game because of her good morals. Or was she? This actress was well cast, because she had the sweetest face ever. And though her character’s motivation was very simple – to get out of debt (her father’s debt) so her father could come home (what a jerk he was to leave her with all that financial burden, eh?) – she was not a simple character. She was faced with the worst sides of people all the time, even her own father, but she was dogged in her determination not to hate the world. In a way, that is harder than anything – forgiveness. She forgave the people who screwed her over, she gave them second and third chances. She saw them as people who were flawed but ultimately good… and isn’t that what people are, deep down? They just get trapped in the wrong path… and don’t see an out. And don’t believe in their own goodness anymore. But she did. She offered them kindness and a chance to redeem themselves. I liked her a lot. There were several other characters who were important to the show, but I just want to focus on two of my favorites. First… the loan shark, played by Jo Jae-Yun. Oh my gosh, how much do I love this actor? He’s so great in everything! He’s usually a side character in most shows, but in this show he was given a large piece of the plot. And his rough around the edges but ultimately lovable interior won me over immediately. 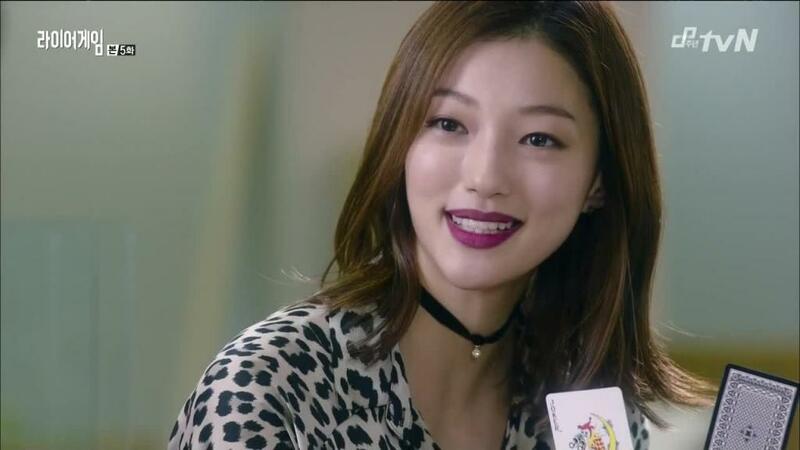 The other major/minor character I loved was the shady lady played by Lee El. How fabulous was this minx? The sly fox? The trickster! She was outstanding as a complicated and self directed woman with her own interests above all others. And yet from the beginning, you could tell she would be complicated. I didn’t expect her to make it so far into the game, but I was so glad they kept her around. Her transformation was amazing to watch – as she shifted from side to side to side. Not to mention how gorgeous she was! Never had a woman looked better in dark lipstick, eh? All the tricks, the deceits, the nerve racking and tense moments in this show were trilling. The actual games were exciting and the games people played with each other were even more so. The twists! Oh my, so many twists. And the ending? Could I love an ending more? NO! It was the perfect ending to a show. ← Review – Can You Hear My Heart?